helping you to be the best clinician you can be. When you use metajournal to stay informed you can feel confident that no major change relevant to your practice will unknowingly pass you by. How long does it take you to change your practice after the evidence shifts? Is peri-operative beta-blockade helpful or harmful? What about aspirin or clonidine? What is the consequence of renal replacement therapy for ICU outcomes? Is a remifentanil PCA a viable alternative to labor epidurals? Is procedural sedation in the ER safe? Does dexamethasone prolong local anesthesia? Can the cervical spine be safely cleared clinically alone? Is rocuronium an appropriate first choice when emergently intubating? Does targeted fluid therapy speed discharge? Individual articles and papers do not change practice on their own — it's the ebb and flow of building evidence, weighed against what has come before and what is already known that when integrated by you, the informed clinician, then leads to practice change. Yet if you only occassionally dip your hand into that stream of evidence your understanding of each piece will always be incomplete. So how can you stay abreast of the most significant and highest quality research without missing what is truly relevant to you, your patients and your practice? Metajournal provides personalized quality evidence for you. What is metajournal? Metajournal is both a personalized and curated weekly email containing the most significant, highest quality and most personally relevant medical research related to your specialty, and an online tool for exploring this evidence. 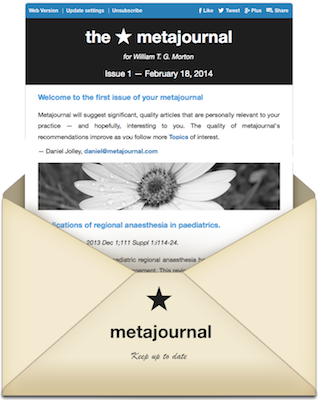 Your metajournal is 'The Medical Journal of You'. Metajournal allows you to save, favorite and share the papers that you find most interesting – knowing that you will always be able to come back to review them at any time in the future, safely kept in your metajournal account. Follow other metajournal users sharing your interests to keep abreast of views and shifting practice within your specialty's community. What makes metajournal so special and unique is its almost-magical ability to recommended you personalized evidence. While two clinicians can likely agree on the relative quality of a paper, and perhaps even the significance of new evidence for your greater specialty, personal relevance is a much more difficult need to satisfy. What makes a paper personally relevant depends on your practice, your interests, your patients and your environment. Personal relevance may share similarity between any two clinicians, but it will never be exactly the same. Metajournal provides the best article recommendations available. Better than flipping through journals, better than traditional eTOCs (electronic table of contents), better than Journal Watch, F1000 or QxMD – even better than those from your colleagues. After signing up you first tell metajournal your primary specialty (don't worry, you can join multiple specialties later if you are more of a renaissance clinician!). Next choose topics that interest you and are relevant to your practice, everything from broad general areas to specific specialized topics – then simply let metajournal do the rest for you. Metajournal will recommend articles to you based on their quality, significance and relevance to your professional interests. As you read abstracts in your weekly emailed metajournal or browse article suggestions online, metajournal learns what is or is not relevant to your practice, and then continues to improve the curation of your personal evidence stream. Our secret sauce is the metajournal Collective Intelligence Engine, which integrates evidence that other clinicians in your specialty are following and interested in along with the unique topics that you are. Stay up to date with emerging shifts, changes in clinical practice and trending areas of evidence. No longer be caught by surprise when colleagues or trainees start changing their practice. With almost no further work on your behalf metajournal will continue to suggest relevant articles. You can further refine metajournal's curation by following more and more topics (the more the better!) and selecting individual journals to follow or stop following. As you find significant or important papers, click the favorite star to save them for later review or share them with your colleagues. This is just the beginning for metajournal. Metajournal's goal is to help all clinicians stay up to date with practice changing research, while balancing the onslaught of an ever-increasing volume of evidence. The metajournal mission is to continuously help you to become a better doctor – and so help improve the health of every patient you care for. We strongly believe that improving the quality and efficiency of healthcare throughout the world by tirelessly challenging each and every clinician to become better informed is a noble goal. Get better at what you do. Be the best clinician you can be – both for you and your patients. Metajournal will not be a static resource, but rather a handcrafted tool that helps you the clinican effortlessly build and maintain your own evidence-based resources, to improve your practice, to help your patients – and to share-the-love with the greater healthcare community! That's me! I'm Daniel Jolley, the CEO/founder of metajournal. I am also the co-founder of the online medical education community gasexchange.com with Brad O'Connor. Metajournal is a much more ambitious and powerful refinement of the original mission of gasexchange: helping doctors to stay informed, get better and in doing so save lives. I am an Australian doctor and consultant anaesthetist / anesthesiologist, with medical interests in anesthesia education, obstetric, pediatric and ENT anesthesia, and the practice of anesthesia in under-resourced environments. I have trained and worked in Sydney, Melbourne, Darwin, Hobart, Fiji and Mongolia – just to keep it interesting. Although my primary clinical work is anesthesia, I have spent time working in both intensive care units and emergency departments – and see a kindred spirit in those working in our sister critical care specialties. We are of the same tribe. While my passion for metajournal is driven by my interests in medicine – the means of achieving this goal are through my interests outside of medicine. I have been coding and programming for more than three decades, with forays into machine learning, mathematics and statistics. It is interesting that every distraction ultimately proves useful! My own desire to stay informed and give my patients the best care possible lead me to complete a Master of Medicine (Perioperative) – the future of modern anesthesia. Because an understanding of organizational function and cross-discipline innovation will be essential to the future of medicine, I have also completed an MBA with an Innovation specialization. Solutions to the world's challenges will not be easily found within individual narrow domains – but will instead lie at their intersection. I'm married to a wonderful woman and father to two wonderful girls – and I hope that any medical care they may receive in the future is always provided by the most skilled, compassionate and up to date clinicians available. I deeply and sincerely hope that metajournal may help you walk along that path. Dr Daniel Jolley, MB.BS (Hon) FANZCA MMed (Periop) MBA (Innov).